The group - Keith, Mick Jagger, Ronnie Wood and Charlie Watts - kicked off their 50 And Counting golden anniversary world tour in 2012, and will make their Glastonbury debut with a headlining spot later this month. They will also perform two dates at the British Summer Time Hyde Park concert series in July. The 69-year-old guitarist told Classic Rock magazine: "I've been hooked on everything once or twice in my life. But the one thing I can't kick is playing with the Rolling Stones. He added: "The 60th, you know, that's a little while away yet, but all these zeros keep zooming by... 30, 40, 50 years. I don't see any reason why there shouldn't be a 60th. Either that or we 'croak' on the job!" 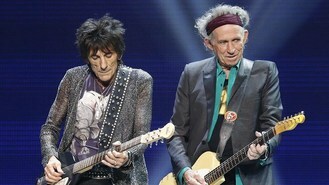 Keith previously said that the Stones are not done yet, because they want to keep going. "It's still too early for me to talk about the Stones' legacy. We haven't finished yet," he said. "There's one thing that we haven't yet achieved, and that's to really find out how long you can do this. It's still such a joy to play with this band that you can't really let go of it. So we've got to find out, you know?"